She's Fantastic: DC Universe Signature Series PLATINUM! DC Universe Signature Series PLATINUM! Team completion is one of the greatest feelings for an action figure collector. It amkes you feel as if you've acheived a goal of sorts, and it makes you feel like the toy companies really care about us weirdos. I was a regular on the DC Message Boards before they were axed last year with with New52 reboot, and team completion for the Metal Men was one of the most constant topics. I honestly never thought it would actually happen, but these past few years have surprized me over and over. Platinum is the third female figure in the first year of Mattycollector's Club Infinite Earths DC subscription program and they've really proved that they're going to squeeze in those desperately needed final figures for us. The Metal Men have been fan-favorites since their debut in 1962. 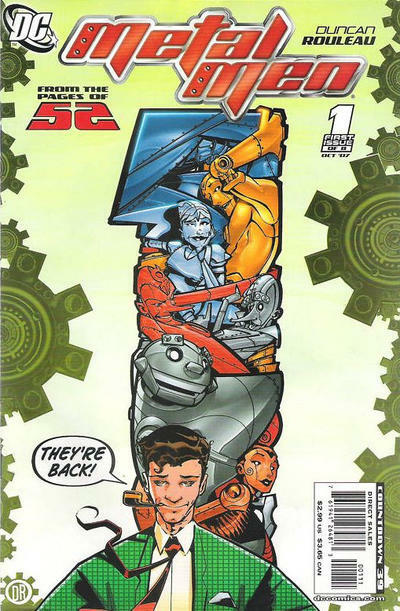 They're quirky, fun, and adventurous, which is always a winning combination in comics. 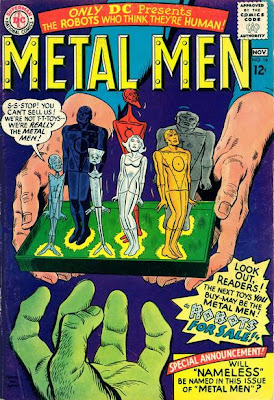 All the members are a living metal, proudly displaying their elemental symbol (or at least a symbolic representation), and they all exhibit Plastic Man / Mister Fantastic body distortion talents. 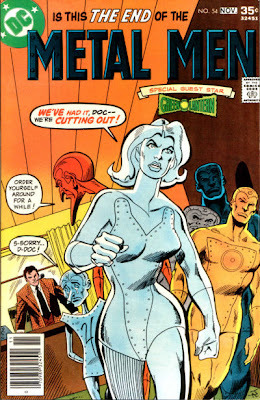 Platinum has a Pinocchio complex and thinks she's a real girl. This figure is great! This is a relief after my disappointment with Poison Ivy. I only have three small complaints with this figure. 1) The point of her tunic protrudes outward like Gold's does.. it looks odd in profile. 2.) Something about her arms seem foreshortened. Perhaps she needs larger hands. and 3) The lack of ankle rocker joints in these figures is becoming too noticeable. Her feet can't rest flat unless her legs are pointing straight down, and honestly DCUC legs never want to point straight down. Platinum comes with the diminutive Tin as an accessory. He is articulated at the shoulders and head, but needs to lean on someone to stand up. I seriously think she's the best looking DCUC figure we've seen in a while. 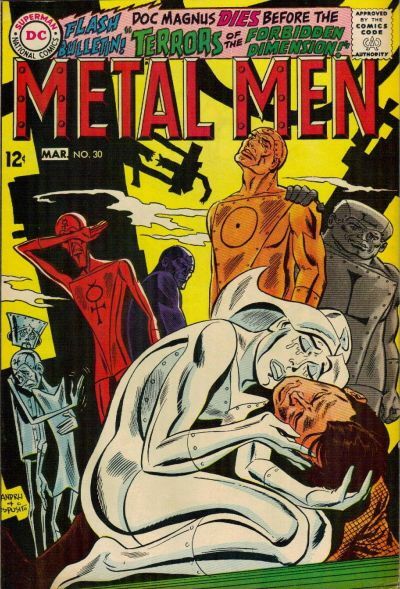 Here are a few images of the Metal Men over the years. They are basically unchanged. Up first are the three DCU Signature Collection girls from 2012: Poison Ivy (customized face), Elasti-Girl, and Platinum. 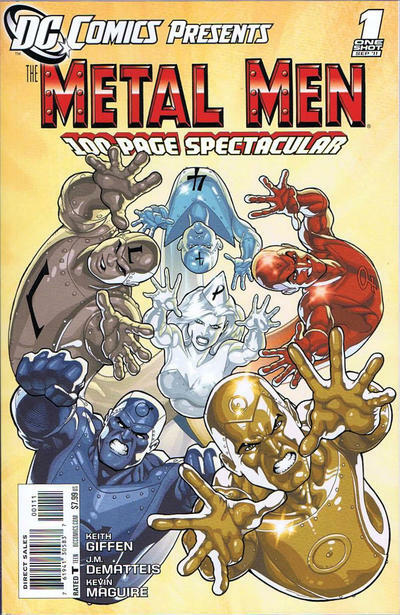 And here are all the glorious Metal Men together. Lead was actually released on the same day as Platinum and Tin, so this team really came together fast. From Left to Right: Lead, Mercury, Tin, Lead, Platinum, and Gold. And here's the same group with their crazy accessories. Lead, Platinum, and Tin did not come with any. Oh wow, the Metal Men really look awesome together! I only received Ivy a few days before Christmas & Platinum/Tin/Lead likely won't be here till late January (to Australia). I like what you've done with Poison Ivy's face there. She is a little uninspiring as a figure & I mainly signed up for her. Platinum does make up for that...fantastic figure! I didn't sign up for next years DCIE. Very low on females. Toyguru did say there would there would be a good selection of superheroines in 2013, but with 8 or so figures already revealed for 2013...Huntress was the only woman. Perhaps they have decided 3 is a good number of females a year. I'd prefer 4 or 5. I feel the same way about Ivy, she was the reason I signed up in 2012 and the reason I DIDN'T sign up in 2013. I hope Huntress comes across more like Platinum and less like Ivy. I didn't read that quote about female characters in 2013. Maybe he meant across all DC lines. My fingers are crossed for a Batwoman in the Unlimited line!